Students have many options nowadays when learning the lessons of history – they can read a book, a newspaper or magazine article written at the time, or watch a movie, documentary or news clip. Or, sometimes most powerful of all, they can close their eyes and listen to those who lived through that period tell their stories in their own words. And that’s what We Stood Up does – provides students and teachers with the opportunity to hear from those who experienced the Civil Rights movement first hand. People like Congressman John Lewis, former Atlanta mayor Shirley Franklin, Greensboro Four member Franklin McCain and Julian Bond, activist and founding member of the Southern Poverty Law Center. The 41 tracks follow an arc beginning with “The Value of Freedom,” that leads to “Reflections on the Civil Rights Movement” and concludes with “Continuing the Legacy.” Each section contains interviews and first hand accounts, poems and original songs. We Stood Up, along with an educator’s guide, are available as free downloads for teachers and community groups and can be accessed here. 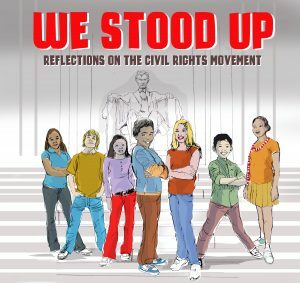 We Stood Up is a fantastic resource for classroom lessons, homeschooling families and those who want to learn more. View the trailer for this resource below (Note – the CD was released on iTunes in August). When looking through my social media feeds, it looked like the last week or so of December was spent bemoaning how horrible 2016 was as we continued to deal with the results of the presidential election, what felt like the almost daily deaths of our childhood/teen icons and the normal stresses of the holiday season. I admit that I often found myself quickly empathizing during both in-person and online conversations with this feeling of good riddance to a year that couldn’t end soon enough. But was what I was feeling a true reflection of the year I had just had? All it took was a couple of hours of organizing pictures for my yearly scrapbook to realize that I was wrong. I had actually had a really amazing year during which I was fortunate enough to do many really fun, fantastic things with friends and family that I love. And that’s what I need to remember as I welcome in 2017. That just as there will be times of sadness, stress and upset, there will also be times of happiness, love and joy. At the beginning of December, I was sent an email with the links to a couple of children’s music videos from Canadian artist, Marlowe & the Mix. I didn’t have time to watch them until this afternoon, but I think I’m going to carry one of the songs, the title track from their newest album, with me as a resolution for the new year. In 2017, rather than wrapping myself in those times of gray, I’m going to try and do as this song says and, “Live in Colour.” I think those are wise words to live by, no matter your age, don’t you?